These bars have been around forever. We baked a variation of these and served them at our wedding reception back in 1982. I know, 1982? Yes, we had ovens back then. I believe these were one of Grant’s Grandmother’s favorites, so we added it to our dessert menu for the reception. We had all kinds of other yummy treats including hundreds of little finger sandwiches that Grandmother Lauder and Great Aunt Mille made the day before the wedding. What a wonderful memory and legacy they left their families of love and service! I still remember those little rolled and layered sandwiches, and the buffet of miniature desserts: Chiffon Nut Bars, Peanut Butter Balls, Shortbread cookies and Hello Dolly Bars. 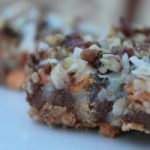 Most people know this dessert by the name “7 Layer Bars” or Hello Dolly Bars. I tweaked this recipe over the years to include a thicker layer of the filling, and baked it less to make the treats a little less dry, and a little more chewy. Every Christmas cookie tray needs a bar cookie. This is it. Crushed cookies and butter. Two types of chocolate. A little butterscotch. A layer of caramel. Coconut and pecans. What more could you ask for in a treat? Not really. Ill be back tomorrow with another Christmas cookie recipe. Heat oven 350°F. Spray 13 x 9-inch baking pan lightly with non stick cooking spray. Pulse crackers in a food processor or finely crush in a bag. Combine graham cracker crumbs, melted butter and 1 tablespoon sugar; mix well. Press crumb mixture firmly into bottom of prepared pan. Top with 2 cups milk chocolate chips. Pour sweetened condensed milk evenly over crumb mixture and milk chocolate chips. Layer evenly with remaining ingredients; press down firmly with fork. Bake 25 to 30 minutes or until lightly browned. Loosen from sides of pan while still warm; cool on wire rack. Cut into bars or diamonds. Yield: 2 dozen bars. -*Veritable Petit Buerre crackers are a plain slightly sweet biscuit-type cracker sold in Europe. I had some in my pantry and used them in this recipe. Don't feel like you need to use up your stash of imported crackers or cookies to make this recipe. Any type of dry, sweet cracker or cookie will work. Or you may use all graham crackers instead of combining two types of cookie.-If you want to make a really thick bar, use a 9x9 pan and bake for an additional 8 minutes on the lower third of the oven.